Boston, MA - June 19, 2011 -World Championship Fighting 11 took place June 18th and provided an action-packed night of fights. In the night's main event UFC veteran Dan "The Upgrade" Lauzon dominated opponent Noah Weisman en route to 1st round knockout to capture the WCF 155lb Lightweight Championship. Both fighters came out aggressive but it was Lauzon who was busier with his strikes. Weisman showed good footwork and head movement to avoid major damage early on, but it was only a matter of time before Lauzon landed a huge punch which knocked Weisman to the mat. Lauzon, sensing his opportunity to end the fight, followed Weisman down and unleashed a flurry of punches which connected and left Weisman momentarily unconscious for the Knockout victory. With the win Lauzon has cemented himself as the top lightweight fighter in the Northeast. Al Iaquinta is an undefeated (3-0-1) professional lightweight MMA fighter. He will be returning to the cage tonight in Atlantic City fighting at Lou Neglia’s Ring of Combat promotion. Iaquinta started as a wrestling- based fighter who has really focused on his striking over the years with Ray Longo. His stand up has reached a level where he's very comfortable with it and prefers mixing it up with his hands now. Al has a KO and a TKO stoppage on his professional resume and is looking to add another knockout to his stats tonight as he faces Gabriel Miglioli. Miglioli recently lost a Ring of Combat title fight in February by disqualification. He will be looking to make a name for himself by knocking off top undefeated prospect, Iaquinta. Al trains out of Serra/Longo on Long Island and is from Wantagh, NY. The Serra/Longo fight team has a busy night tomorrow but none as important as Iaquinta's fight. Al is on the verge of getting the call from the big dogs. A win tomorrow night could land him a shot in the UFC. Ring of combat has had over 50 fighters make it to the next level. Iaquinta is the next one to go possibly with a great performance tonight. I'm guessing he will follow a similar path to that of fellow teammate and winner of his second straight UFC fight this past weekend at UFC 131, Chris Weidman. Chris got his shot by taking UFC fights on short notice because of fighters getting hurt. I feel that's where Iaquinta will get his chance to mess with the best in the world. All this talk doesn't happen without a win tonight, some big pressure on the talented lightweight. Pressure is no problem for the Wantagh native. With a never say die attitude, a heart of a lion and a work ethic second to none, Al has to be the overwhelming favorite for tonight's bout. I foresee great things in this young man’s future and TheGARV.com will be there every step of the way. Al is very active in local MMA fitness and training community. He has an awesome site at www.IaquintaMMA.com where you can see blogs and vids of past fights, or schedule a personal training session with the future MMA star. Good luck to Al and all the other Long Island fighters tonight ! Check out this Iaquinta 15 second KO over Tim Sylvester from ROC XXV. 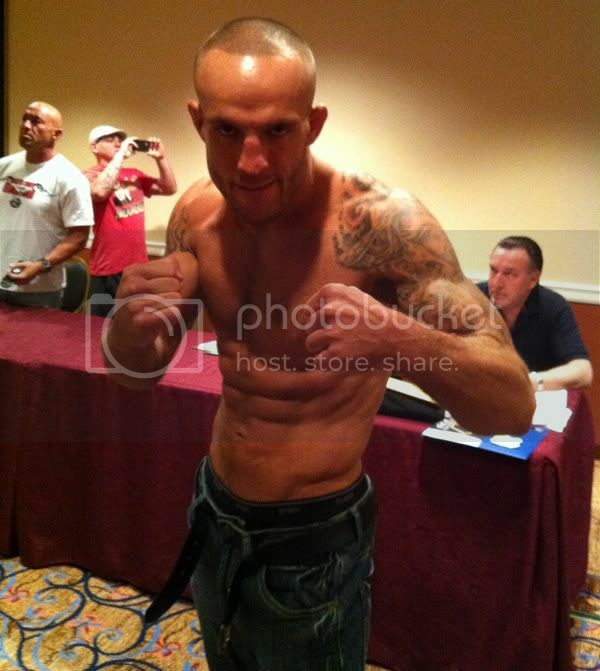 Pete "Drago" Sell looks like a man on a mission in these Ring of Combat weigh in pics. He is making his MMA comeback after taking 2010 off, and looks lean and mean and ready to fight. He'll get his chance tomorrow night when he takes on Elijah Harshbarger. Sell got his start with Lou Neglia's Ring of Combat, and from there, like so many other fighters, he moved onto the UFC. Now he's back and he's looking to reestablish himself as a top contender by winning the ROC welterweight title. Standing in his way is the very tough Harshbarger, who dominated in his last outing, a three round decision over George Sullivan back in April. This fight is going to be a doozy. Tickets are still available at the box office, so hurry on down the Tropicana Casino Hotel in Atlantic City, New Jersey to check out the action live tomorrow night. Here are the complete weigh in results and another pic, this one of Sell and Harshbarger squaring off. Jorge Masvidal: "KJ is the Only Thing Standing in my Way"
“Gamebred” perfectly describes heavy-handed lightweight Jorge Masvidal who is in action this Saturday night against fellow boxing technician K.J. Noons. In a fight which many perceive to be the highlight of the card, and the winner getting a shot at champion Gilbert Melendez, fans everywhere are buzzing about this match-up. TheGarv.com’s Kalin Johnston caught up with Jorge to get his thoughts on what the Miami native describes as the biggest fight of his young career. Dave "Pee Wee" Herman: No Jiu-Jitsu For You! 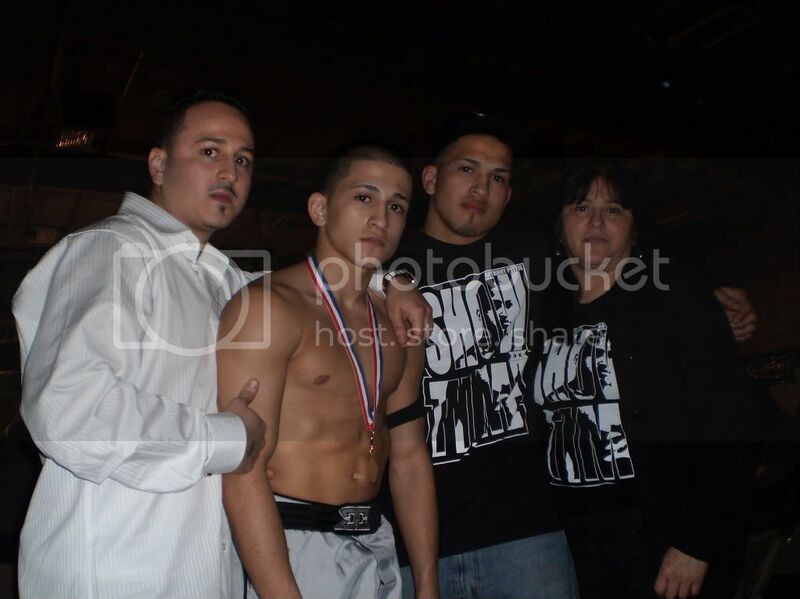 Note: Vic Torres Jr. is a new contributor to TheGARV.com and is an amateur MMA fighter and kickboxer. He and I train together at Team Renegade. Vic will be giving us his insights and unique perspective on all things MMA. Welcome aboard, Vic! Dave "Pee Wee" Herman, a 21-2 heavyweight fighter, made his UFC debut this past weekend in Vancouver at UFC 131. Herman was on the winning side of his fight, earning a TKO victory in the 2nd round. That impressive win was overshadowed by comments made by the man they call "Pee Wee". "I honestly really don't think it does [work]," he told Ariel Helwani on the MMA News Hour. "If you have any knowledge at all of jiu-jitsu, it's just not going to work. If you literally have never heard of anything and have no idea what they're doing, OK, kind of like the first UFC, yeah jiu-jitsu works. It's kind of like trickery, basically. If you have any idea about any of the tricks, it's just not going to work, unless you're a complete idiot and fall for it." Rick "The Horror" Story is coming off the biggest win of his career, a three round unanimous decision over Thiago Alves at UFC 130, which took place just a couple of weeks ago. But there's no time for Story to bask in his victory, because he's got another fight coming up this month. 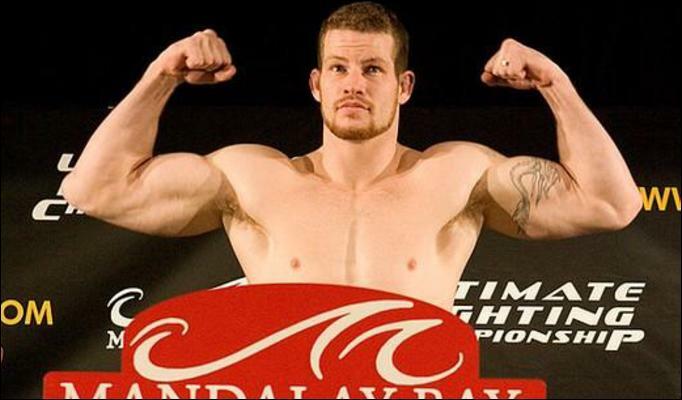 At UFC Live on June 26, Story will be taking on Nate "The Great" Marquardt in the main event. Story is a late replacement for the injured Anthony "Rumble" Johnson, and a win against Marquardt could put him in line for a title shot. On yesterday's UFC conference call, Story talked about fighting again just a month after his previous match. He also talks about fighting a physically big opponent like Nate, and about Jon Fitch's ho-hum reaction to being called out. We requested for a fight quick. Maybe not so quick, but with the opportunity of Anthony Johnson dropping out—I mean, I like fighting frequently so we jumped all over the opportunity to be able to fill in for Anthony Johnson. The challenge is sticking with an intense training regimen for a long time. Because the training camp for Alves was awhile and trying to stay away from injury and everything, that’s another challenge when you’re training so hard. But at the same time it’s awesome training like that, and jumping right back into a training camp when you’re in shape, it’s really easy to throw one or two things into a game plan to get ready for another fight. I’ve gone against strong opponents, like really strong big guys. I don’t know really exactly what to expect [from Nate]. I know Nate’s a strong middleweight fighter and if I go out expecting the worst I’ll be fine. It is what it is. I can see his standpoint, but I’ll fight whoever whenever. And if I got called out I’d be more motivated to take that fight. I think it’ll put me up there and it’ll definitely open people’s eyes. And maybe put me in line for a shot [at the title]. Nate "The Great" Marquardt is training hard for his June 26 fight against Rick "Horror" Story, who replaced the injured Anthony "Rumble" Johnson for the UFC Live show. The fight will be Marquardt's first as a welterweight, as he moves down from the 185 pound middleweight, a move that is surprising given how big he is at middleweight. But he feels that the weight cut won't be a problem and won't even bother with a practice cut. On today's conference call, Nate talked about the weight cut, his game plan and what a win over Rick Story would mean. My weight right now is really good. 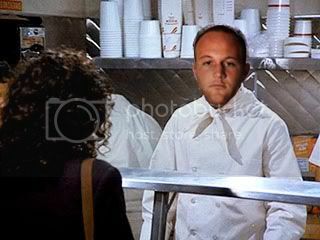 I’m really not worried about the weight cut. It’s something I’ve done in the past and this time I actually have a dietitian helping me out. I’m really not worried, I’m just focused on the fight. The weight cut’s nothing serious for me. There’s a lot of differences between [Rick Story] and Anthony Johnson, obviously. My game plan against Johnson was very basic and my game plan against story is also very basic. So it’s not a huge change for me. A last minute change like that, it can be tough if it’s a huge difference in game plans, but for me it’s not. I guess it will put me at the top [of the welterweight division]. Rick’s a very tough guy. He just beat Alves, who is a former world title contender. I’m just excited for the opportunity. Have you ever met someone who right away you know will not let anything get in their way? 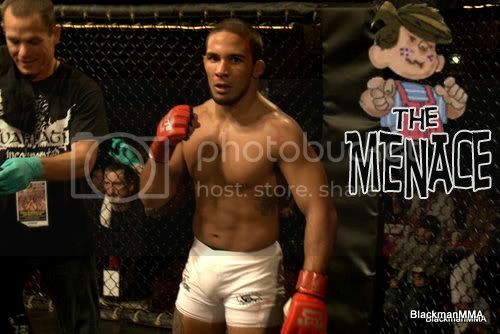 That’s the feeling you get when you first meet Dennis “The Menace” Bermudez. As I sat down with him and heard his story, I quickly learned that this man is more than just a cage fighter. He is a fighter, period. Life has thrown him some curve balls, but he still has not let anything stop him from getting to where he is now. Dennis has just moved to Long Island from Pennsylvania, where he is currently in the process of reinventing himself as a fighter. 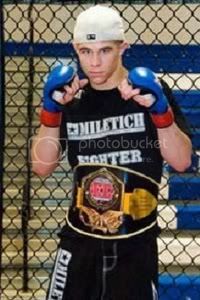 Under the tutelage of Gregg Depasquale and the coaches at Long Island MMA, he plans to become a champion. Of course like any story things didn’t start out this way. Dennis was a High School wrestler who was told that he couldn’t make it in the college ranks, let alone a Division I school. To prove the naysayers wrong Dennis walked on to Bloomsburg College, a Division I wrestling school.